Once again this was a meeting of just two people (three if you count Yahshua himself!) Even before we met, the Holy Spirit gave me the verses Psalm 81:6-7 and reminded me that we don't have to struggle; we've been set free. HalleluYah! And in verse 12 it's clear that we do have an alternative. Instead of doing it his way we can 'follow our own devices', we can do it our way. But that's not a good idea. 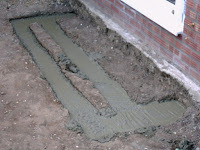 I'd been mixing concrete most of the afternoon, and pouring the foundations for some garden steps; concrete was on my mind. So I wasn't surprised when the Spirit told me that people mix concrete which is wet and weak and can support nothing, but they pour it into the trench knowing that by the following day it will be set and within a week will have become strong enough to support a tall building. He said, 'So it is with you - you are weak but I am patient and I know you will become strong enough for the task I've given you'. While we were meeting together he said to us, 'I am like a beating heart in the body of my church, and I will lead you'. This was so precious, and so relevant to our needs. For years I've been struggling with the issues of leadership. It seems very clear to me that the church shouldn't appoint leaders to tell us what we should do. I had concluded that the only alternative was to have no leaders at all because we all share one leader, our saviour and king, Yahshua. But now he was showing us that we should all lead, and we should all follow. A third alternative that I'd failed even to notice! How simple, how elegant, how revolutionary, how obvious! So now, instead of agonising over every issue in the church, if something seems right to me I will simply do it. We all have permission to act providing we do so in love, guided by the Holy Spirit, and under the kingship and headship of Yahshua. Psalm 81:6-7 is right; we don't have to struggle; we have been set free.